With the introduction of the new Nook Wi-Fi and subsequent price-drops of the Nook 3G and Kindle 2, choosing the best device of the three can be a difficult decision. So which one is the best ereader to choose? Well, the good news is that you really can’t go wrong with any of them at these new price points, and choosing one just depends on a few different factors that you’ll need to consider. This article compares the $189 Kindle 2 International versus the $199 Nook 3G and $149 Nook Wi-Fi, so you can easily weigh the pros and cons of each to find out which one is best suited for your specific reading needs and wants. 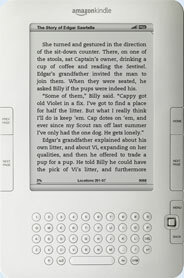 The Pros and Cons are directly comparing Nook vs Kindle, meaning the pros for the Nook are features that the Kindle doesn’t have and vice versa. 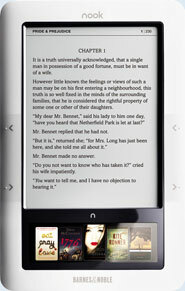 In considering the Nook Wi-Fi, it has all the same exact features as the original Nook, just without the 3G wireless. Supports Adobe EPUB and PDF DRM, meaning ebooks can be purchased from many websites other than B&N. Free 3G wireless connection to B&N’s online ebook store ($199 model). Color LCD touchscreen pane for navigation, typing, etc. Wi-Fi, plus free Wi-Fi at B&N stores and AT&T hotspots. In store ebook promotions for free ebooks. Lend a purchased ebook one time for 14 days (if approved by publisher). Android operating system is hackable. Limited ebook organization options, no customizable folders. Notes, highlighting not very functional. Subtracting the free ebooks, B&N has 151,743. Battery life is less because of color screen and Wi-Fi. Basic web browser with free internet using free 3G. Over 615,000 total ebooks available in the Kindle ebook store. Now supports collections (folders) for organizing ebooks. Almost 200 newspaper and magazine subscriptions available, compared to B&N’s 33. Available to over 170 countries. Free wireless in over 100 countries. Several exclusive free ebooks added monthly. 30-day return policy vs Nook’s 14. Text-to-speech (if approved by publisher). Compatible with audiobooks from Audible.com . Keyboard more functional for typing and adding notes. Doesn’t support EPUB without conversion. Not compatible with ebooks from libraries. The Kindle Store has limited search options. That’s the Kindle 3, the Kindle 2 never had WiFi. This post is from a while ago. Here’s a more updated version comparing the Kindle 3 vs the Nook.